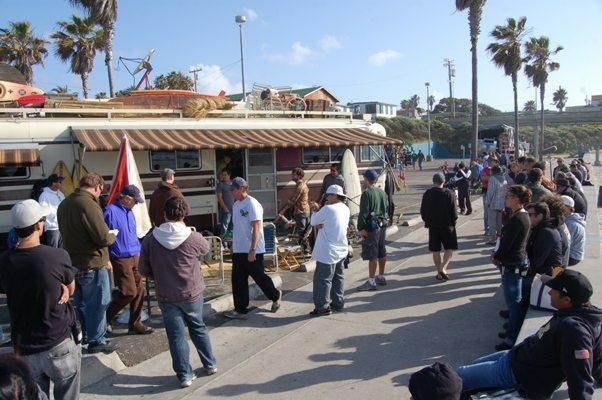 Just another busy day on the set of "Terriers" - the TV show being filmed in OB. Photo by Jim Grant. Local media have reported that dozens of syringes have recently washed ashore at Ocean Beach, and were found scattered near the surf line Wednesday, April 14th, along about a quarter-mile stretch of shoreline just south of Dog Beach. OB lifeguards said several people walking on the beach told them about the syringes. More than 50 syringes were found. By the time lifeguards got word of the discovery, citizens had collected and disposed of nearly all the syringes in city trash cans. But there were no reports that anybody was stuck by the medical the plastic hypodermic devices, most of which had bent needles attached. Lifeguards collected them out of the bins, then conducted a “slow, thorough” search of the entire beach, finding several more syringes in the process. The lifeguards put the syringes in a collection container and contacted county environmental health personnel who came to the beach and took the container. Ocean Beach has a dynamic coffee culture and vibrant history. 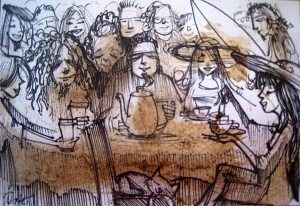 The OBHS will present an interesting and humorous program about our local coffee houses and who some of the characters are that frequent them. We will be joined by some of the present and past owners of these establishments. Find out about what events were held in our coffee houses. Learn what celebrities came out of our local java joints. See samples of art and photos that grace their walls. Share your favorite Coffee House experience and join us for a cup of coffee and snacks after the presentation. The “Adopt-a-Fire-Pit” committee is attending the OB Town Council meeting on April 28th in the hopes that the Council will vote to save the fire pits. The City plans to remove all 8 of Ocean Beach’s fire pits – along with all the 185 fire pits throughout the beaches of the city – beginning July 1. The Council meets on Wednesday, April 28, at the Masonic Center located at 1711 Sunset Cliffs Blvd. If you want to join the crusade to save these iconic symbols of OB and San Diego culture, please plan on attending. The meeting begins at 7, and this item should come up about 7:15 or so. The “Adopt” group is also meeting with Councilmember Kevin Faulconer on the same issue on April 22nd. Giovanni Ingolia is the new Chair of the Board, and Landry Watson was selected as Vice-Chair (vice chair typically runs the Project Review Committee…formerly the Land Use Committee). The secretary continues to be Seth Connolly and treasurer is Jane Gawronski. All other subcommittees and liaisons were confirmed. The Precise Plan Update Committee is run by Mindy Pellesier. Bill Bushe was appointed to District 3 — which didn’t have a person running on the election. Bill is a long time prior member of the board but was beat in the election last year by Rob Sullivan from the Blue Parrot Restaurant. Bill was the only appointment. Heather Kwiatkowski (Dist 3) announced that she got accepted to a Masters Program and is leaving the Board effective this month. That will leave an open seat in District 3. In other Planning Board news, the City of San Diego has expanded the scope of the OB Library expansion to include the adjacent building. It is not historic in any way. The OB Library would then be a true premier City service structure in OB. The design looks great and it will be a LEED Gold building designed by Hanna Gabriel and Wells (our local architect firm). There is no date for breaking ground, as no funding has been identified for the expansion. This is all just design and permit drawings. From 10 am on to 6pm both days, join antique dealers on Newport for their annual “Legendary OB Antique District” event, on the 4800 and 4900 blocks of Newport Ave.
Monday, April 19th, at 8.30am, come to the Clean OB Committee meeting, at the Antique Center, 4822 Newport Ave. Call the OBMA, 224.4906 if you have any questions. At 8:30am, the Crime Prevention Committee meets, and is a sub-Committee of the Economic Restructuring Committee. Meetings take place the 3rd Tuesday of each month at 8.30AM. The April 20th meeting will take place at the Police Trailer in the Pier parking lot. The OB Town Council meetings start at 7 and the fire pit issue will be probably addressed about 7:15 pm or so. I’m hoping somebody who went will tell us a little about what happened. Pat? Kathy? Did anyone else notice that the crime prevention committee meets on 4/20? Last night’s meeting of the Ocean Beach Historical Society was outstanding (literally people were standing outside the door). Kathy Blavatt did a great job with the presentation. The evening commenced with her presenting Ray with a book she had published of Rays napkin doodles he’s done over the years mostly in the coffee houses (for his birthday). They are both incredibly talented people. We are grateful they are part of this organization. Thanks to all who made this possible, and all those who attended. You reported on my husband’s passing last January 13th 2009. I just wanted to let you know that I have posthumously produced his first album and the CD release event will be this April 29th at Portugalia 6PM to Midnight. It is a pretty big deal and just wanted to let you know if you wanted to put it in the paper. The San Diego Food Bank will be at the OB Elementary auditorium at 8 a.m. on Wednesday the 28th to help anyone who feels they might qualify for food stamps (an EBT card) get the process started. Newer Article: Wait! Don’t Sign That Petition! It’s a GOP Dirty Trick!